When in Egypt, it's certainly a must that you would go to any and all temples you can to see these ancient monuments that still somehow stand. 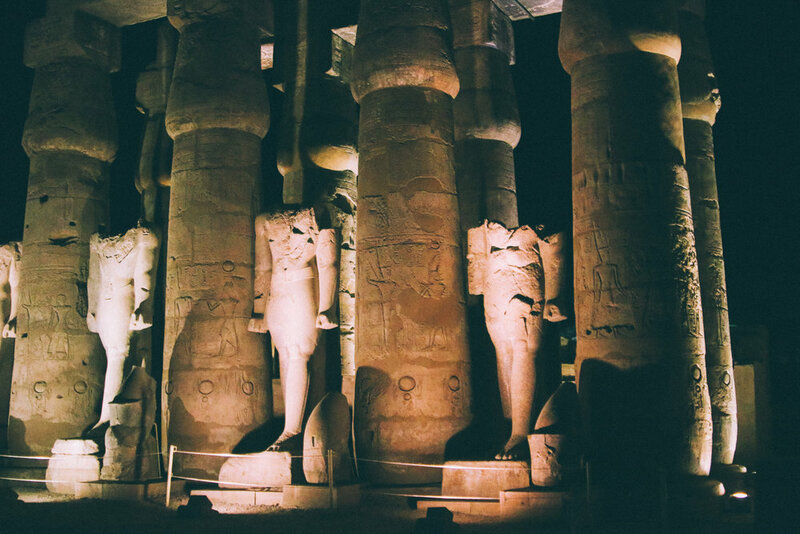 There's so many to see, and while a day trip to any of them will be exhilarating, there's a temple in Luxor (appropriately named Luxor Temple), that is at its most epic in the evening time. The special thing about this temple is that while others close earlier in the day, the Luxor Temple stays open later so you can get a glimpse of it at night. The architecture is lit up with lots of lights, making the entire place illuminated. If you already were thinking Egypt is an Indiana Jones lover's fantasy, walking through this temple at night is like being in the movie The Mummy. There's spots where the lights make you feel like you're running down a hallway to get away from a member of the underworld. The avenue of sphinxes looks especially ancient and eeire at night. So if you've spent your day exploring all that the city of Luxor has to offer, but you're wondering what to do with your night, save Luxor Temple for when the sun goes down. If you want it to be extra special, go during blue hour, which is that sweet spot right at the end of sunset where there's still a little light in the sky, but dusk is approaching.